Finding the perfect place to keep your recreational vehicle when you're not using it is an important decision. Not only are looking for a storage facility to keep your RV safe from theft or environmental dangers, you want a location that's easy to get to, offers great amenities, and provides you with the storage solution you need. Often residents in Redlands, CA, think they've found the perfect place because the marketing materials look great and the sales people are confident. However, once they read the terms and conditions of the contract they learn the facility may not be the right fit after all. At Vines Storage, our team understands that owning a RV is part of who you are. It allows you to see the country, visit with friends and family, and make amazing memories. When you're not in your RV, it's important it be parked in a safe and protected facility. Further, we understand that every RV owner is different. Some will want an easily accessible outdoor location, while others will prefer a climate-controlled indoor environment. While our outdoor spaces are safe and keep vehicles secured behind a locked gate and heavily monitored location, the indoor storage units keep your RV protected from intense sun that can fade the paint, heavy rains, dust and dirt, or rodents and other outdoor critters. 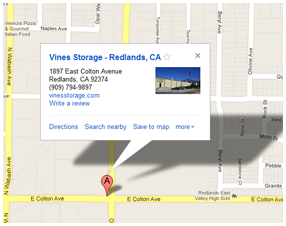 In addition to flexibility regarding location, Vines Storage offers flexible terms in regards to length of your lease. Whether you're looking for a place to park your RV every Monday until you pick it up again on Friday or if you're looking for storage over the winter, we can customize a lease to your needs. Finally, our facility offers convenient amenities like compressed air, ice, filtered water, and a waste dump station to get you on the road or back to business quickly and effectively. For more information on storing your recreational vehicle or to secure your storage space or unit, call Vines Storage today. Our team of professionals will provide you with the advice, service, and amenities you need to gain your business and your confidence.